Gerald lives in Beckenham in North West Kent and works as an Analyst/Developer for a pensions software company. He has won all of the major domestic bridge events, mostly in partnership with his brother Stuart. 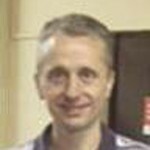 Gerald was a member of the Junior World Championship winning team of 1989 and then went on to be a regular in British and English Open teams throughout the 1990s. Since the 1999 European Championships he has cut down significantly on his bridge commitments to spend more time on other (mainly sporting) interests, but has continued to play in some of the major domestic events.